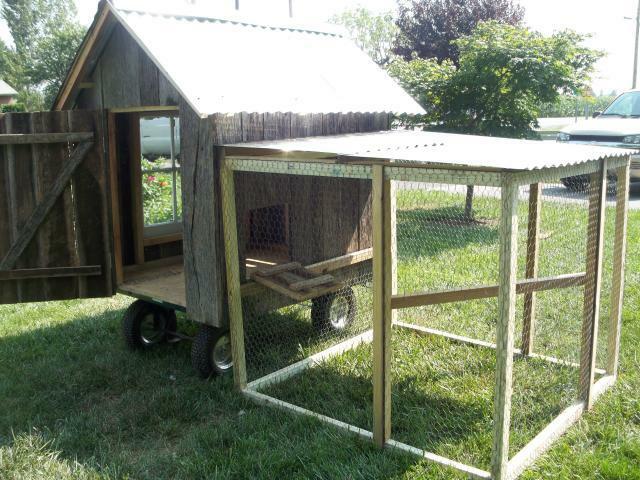 Below is a picture of a coop we built for someone. The birds love the protected, outdoor space. Even on the nastiest days, they hang there. 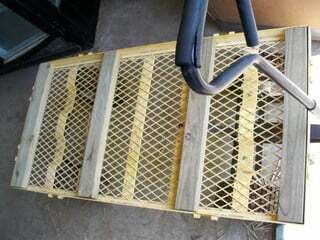 We started with a heavy duty garden cart we found on Ebay. These carts are rated for weight over 1,000lbs. and have been turning up for sale on newspapers and on Craigslist so keep your eyes peeled. 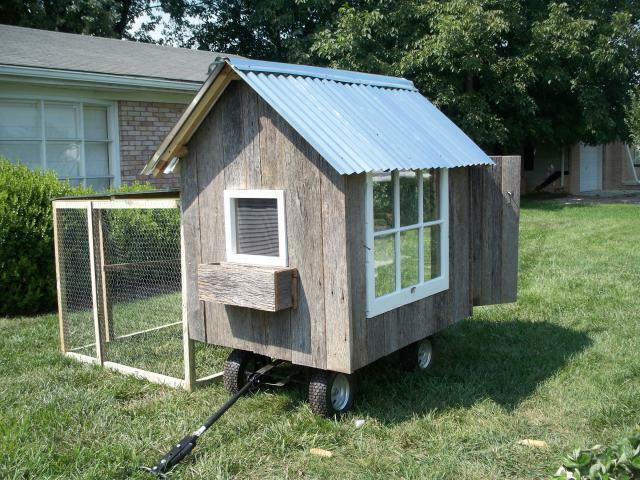 This one was perfect for making our small-sized chicken tractor to accommodate our banty cochin trio. 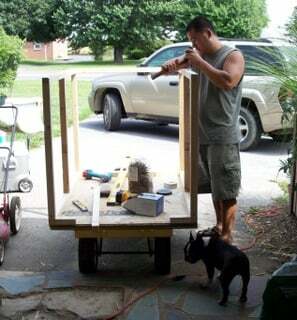 We took off the side rails and bumped up the top with 2x4 to make them level with the outer lip. They were secured with bolts. 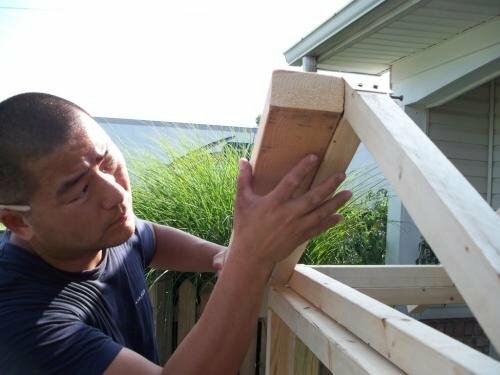 We topped those with 2x4's that measured 36" but now I think we could've pushed it a bit more. We could've extended it out the back too but not the front. We had to leave room for the handle to move around. 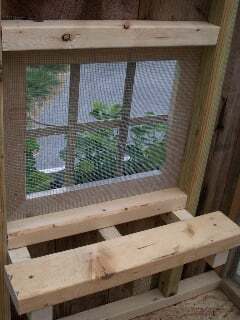 We framed out the sides to allow for some reclaimed windows and I added a small window in the front for "curb appeal." The trusses were mitered to an angle we liked, screwed then reinforced with metal plates. We screwed them directly to the frame then reinforced them with cross braces. You can see we also blocked in between the trusses in order to keep out predators when the metal goes up. 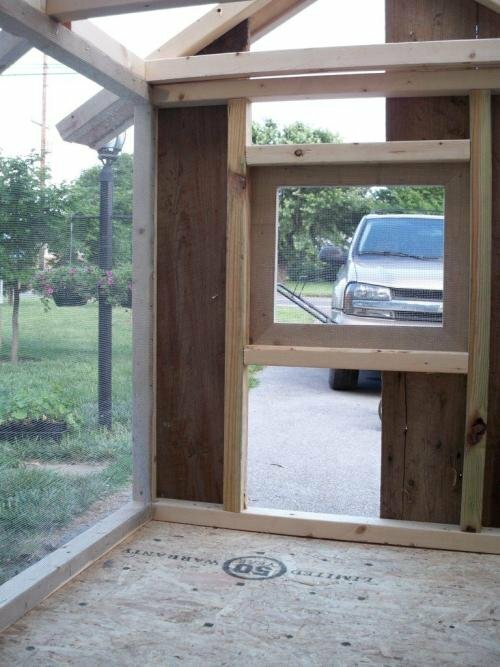 We used hardware cloth and stapled that to the insides of the windows for some nice air flow when the weather is decent and the front window will be all season ventelation. 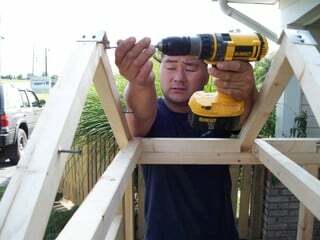 Here's Rusty screwing in the 2x4 that will make the overhang for the roof. 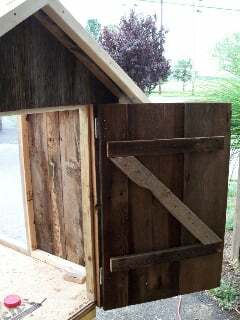 We added a balcony for the chickens to chill by the window and check out the goings ons and made a door out of the barn board siding with a traditional "Z" style backing then attached with hinges. 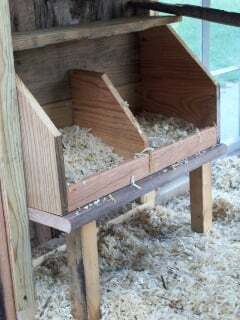 Here are the nesting boxes. They are approximately 10"x10" (bantam sized). They are made from whatever pine we found in the garage. They are right inside the door for easy egg hunting. Here's a pic of the finished product...well, almost finished. Of course, I had to get the geraniums in before the roof. Prioritize, Erin. We were hoping to come across some aged standing seam from a fallen barn but no-go. We wound up purchasing this corrugated sheeting at Lowes for $13 per sheet. We used 2. (1/2 sheet went to each side and then a long strip from the 2nd to bend over the top. 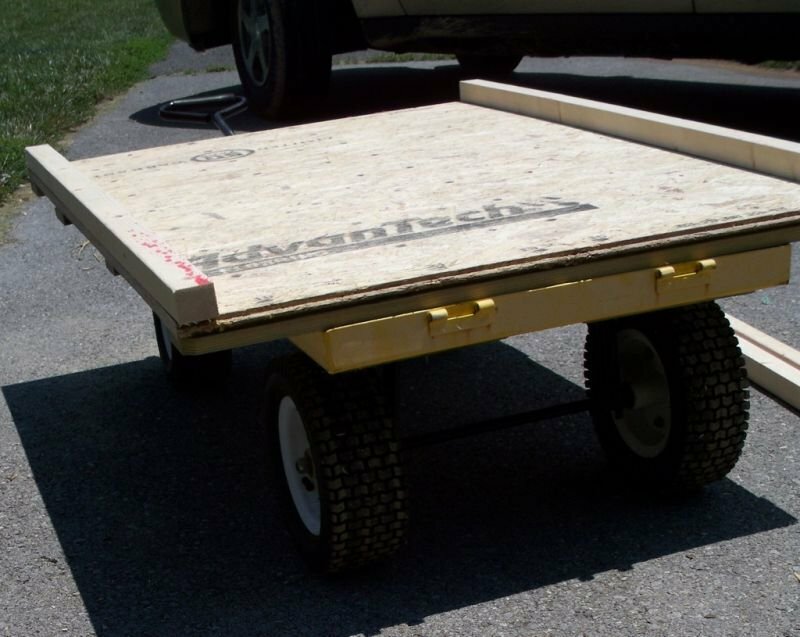 We used screws with rubber washers that melt on the first hot day for a tight seal. Things I LUV: The fact that it's on a cart. It is so easy to move. trumpeting_angel and MotherOfPeepPeeps like this. 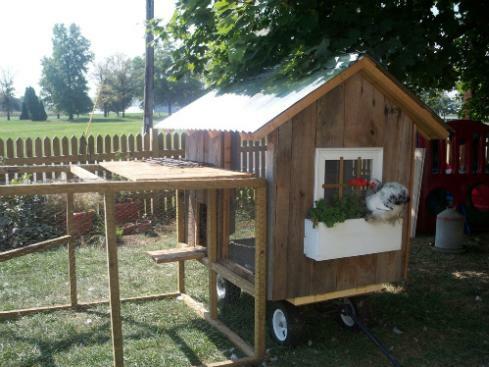 I'm going to go with this general design for my new coop. Very pretty. 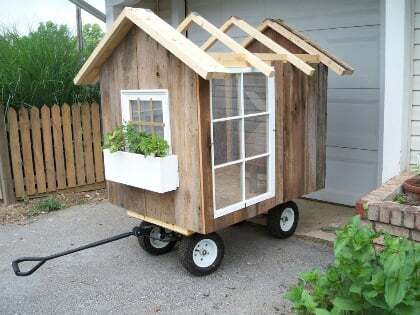 I’m on the hunt for a garden cart! Brilliant! And cute! What kind of wheels did you use? One of my favorites! 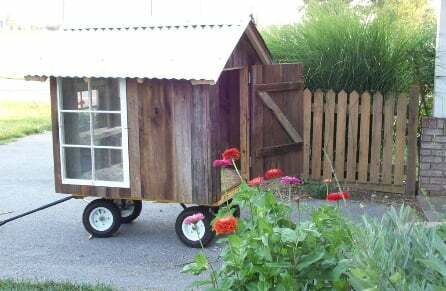 Made really well--love the wood, window and the cart--too cute! 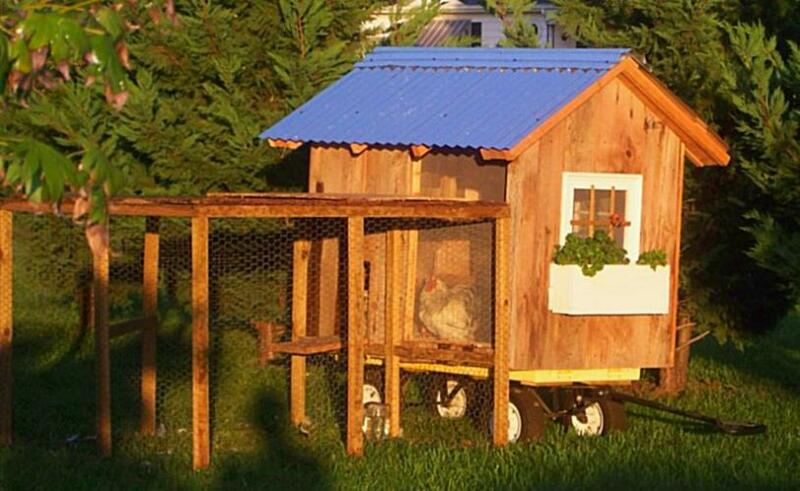 Great-looking coop, such character. Thanks for sharing. Great coop, love the design. 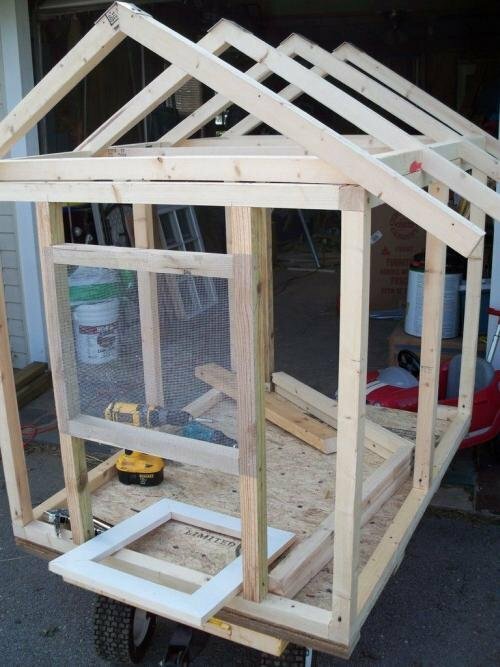 do you have plans for this coop that you sell? I really like this! 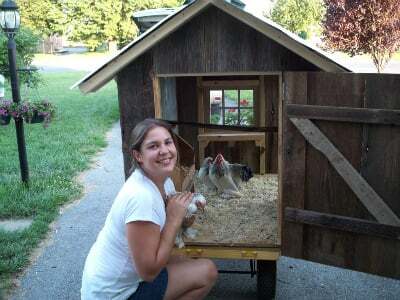 I think this might be a way for me to finally have chickens.